Hi guys, and welcome to this short session having a look at our client sentiment feature in more detail. As you can see there I've already got about 10 products here already pre-selected. I just want to quickly run through what all of this means, how you can utilise it, and some hints and tips about how you can get the most from it as well. So the first thing I'm going to do is just squeeze it out a little bit further. I just like to have the smaller view, but guys, it's entirely up to yourself how you decide to use it. So first of all, it's got the product name, and you can see there it says 'All Clients'. I can switch between all clients, top clients, and show a combined view, but I'll come back to that in a second. I should point out (that) if you want to have more information about client sentiment, you can also find it in the information section. I'll take you through this piece by piece. So, on the left hand side, you've got the number of clients that are trading this. Effectively, if you've got 10 clients trading in this, five are long, five are short, that would be 50/50. Okay? So quite simply (the) number of clients, number of unique clients that are currently trading and this is the percentage difference between the two, okay? You'll notice there that it's got a down arrow and 6 per cent. What that's telling you is that this (has) actually dropped. This was actually 69 per cent as of 10pm last night, and the reason why I'm pointing that out is this figure right here is actually within the last 60 seconds. So client sentiment at CMC Markets updates every minute and during the session you may actually see it tick up or down, depending on if there's a lot of client activity at this time. So this is the number of clients. You can see that 37 per cent are buyers, 63 per cent are sellers, and this figure here, is down 9%. As you can see there, the inner circle is basically the time from 10 pm last night, and this is the current percentage within the minute, okay? Now, on the right-hand side, you've got 'by position value'. By position value is effectively like the total exposure, or basically, where the big money is. So this might be the number of unique clients, but let's say you had ten positions running, one guy was short or was selling a million pounds worth and all the other nine guys were buyers, say ten grand's worth, there would be a massive skew towards the sellers, because there's a lot more money selling than there was buying. So in this particular instance here, you can see that by position value, or by exposure, that 23 per cent are buyers and 77 per cent are currently sellers. So this does give you quite an interesting viewpoint as to the difference. So you can see there you've got 37 and 63, and here you've got 23 and 77. Just below that, you've also got 'also being traded', so these are other products that are related to traders who are trading this are also trading these, and you can left-click on this, and it will load up the same screen as all these other clients in the windows right here as well, so that can be quite useful. But typically, I like just to concentrate on my favourite products, and these are the ten most popular here at CMC (Markets), so I'm going to stick with the current formation. So, as you can see, you've got all clients. 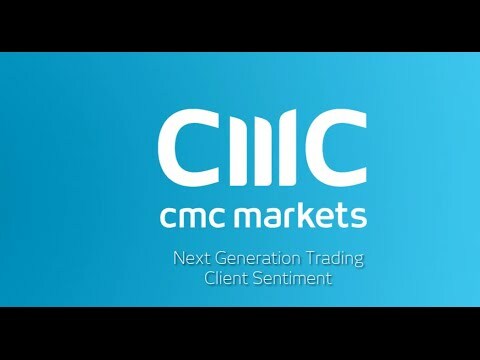 All clients at CMC Markets on the Next Generation trading platform. If I flip forward to top clients, this takes the exact same calculations, but only applies it to clients with a minimum of three months trade history, who have made a profit without obviously taking into account my spreads and commissions. So you've got top clients and then you've got all clients and you can see in this particular instance, they're kind of similar. But then if I flip over to the next side, you saw that just tick up there right now. If I flip to the next side, which is the combined view, what this does is overlays the all and top clients. And you'll notice there is a slight change in yellow. You've got the all clients is a darker orange, and the top clients, which are the guys I said have made a profit over the last three months minus spreads and commissions, is more of a slightly yellow colour. What you can actually see from here, there's some quite interesting data, this is again within the last 60 seconds. It's increased so there'd be more sellers come in since 10pm last night. So there'd be an extra 2 per cent increase there on the US 30. Now, ideally, if I just flip forward and make these all combined views, one of the things I quite like to look for, like a little hint and tip, is to try and spot products that have got the biggest difference between all and top clients. So let me see if there's anything here that stands out. Right away you can see gold here has got quite a big difference, you can see that there's quite a big change there. You can see that top clients are 52 per cent of the buyers whereas all clients are currently 63 per cent buyers, so there's a decent change right there. You can also see on brent crude, there's also a relative difference right there. You can see the top clients are more heavily buying into brent crude versus all clients, and conversely if you look at GBP/USD, you can actually see there that there's less top clients selling into GBP/USD right there, so it can be quite interesting to see it. The Germany 30 is another example right there, where you can see that the top clients are 66% sellers, whereas everybody else is 78 (per cent), so it can be quite useful to try and find products with the biggest differential between all and top. It just gives you some interesting insight as to what's happening next. Another kind of tip for users of this kind of going forward is, I like to look for products that have got the biggest change from 10 pm last night. So gold here's a prime example, where you can see here that our clients were a lot more bullish at 10 pm last night versus what they're doing right now. So this is actually down 15%. You can see it just ticks there in real time as it updates. And you can see that now it's actually 10%, so you've actually had quite a big swing right there. That was just 15 just a minute ago, so there is obviously a big client trading on gold right now. It's just kind of interesting to see how it works. So ideally, you're looking for big swings, and then do a little bit more research. Why is there such a big difference in buyers and sellers on this product from 10pm last night? And just continuously monitor this to see what happens, because, as I said, it does update in real time. Now, you guys can obviously go ahead and utilise this any way you want. I've got one layout view that I've pretty much dedicated to client sentiment, but you can load it up very easily by just left-clicking here, and selecting client sentiment from this. And it's always product-specific, and remember that you can launch order tickets directly from here. You can look at new charts, open quote panels, you can get everything that you need to from the drop down menu. But the client sentiment feature really does give you a nice overview as to what the rest of the CMC Markets clients are doing, and it tells you by the number of clients, so it gives you an idea of those unique clients that are trading and what their position are. Are they more biased to selling or to buying? And then on the right-hand side you've got the position value, which I've said is like the exposure where the big money is and again you've got this nice combined view where you can see the difference between all clients of CMC (Markets) and just those that have made a profit over the last three months minus spread and commissions. So it does give you a nice insight as to what our clients are thinking. Well, anyway guys, I hope you found this short video interesting and if you do have any feedback on the client sentiment feature, remember you can go to support and just go to feedback there and leave us any feedback as you see fit. Anyway guys, I hope you've enjoyed the session and keep an eye on YouTube for many more videos.